Leg 2 from Rio, Brazil to Cape Town, South Africa. 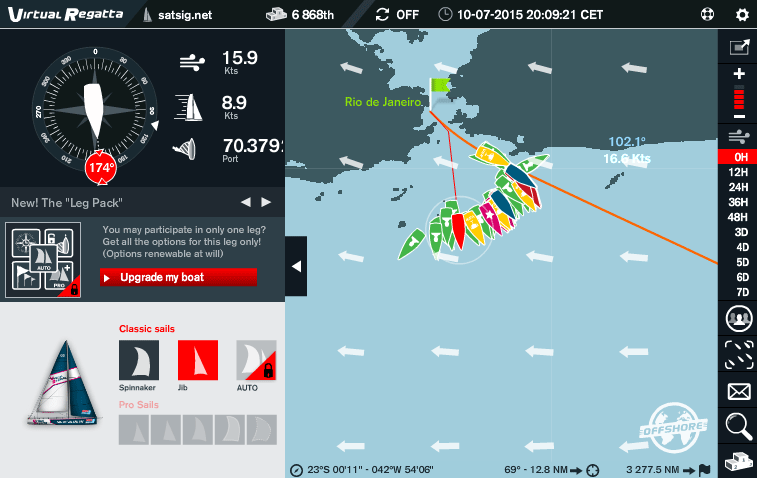 The blog is about the BRITPACK 7 team of 8 boats participating in the virtual round the world sailing at http://www.virtualregatta.com The boats are Clipper 70's with standard basic sails and no automation. This page is being modified daily, and sometimes more or less frequently. It's Wednesday 7th Oct 2015 now. I've found a way to get grib files with only times of 0600 and 1800 for almost 10 days, so replicating what happens in the game. First time done it today. With fast moving weather patterns it is no good having high time resolution (e.g. evenly spaced every 6 hrs) which make it more like real life but makes things seem possible that would not be in the game, such as keeping up with strong following winds as they move along. I've also noted that in Rio the wind blows from the east at midday and midnight but from the north east at 6am and from south east at 6pm ! amazing. 17 minutes after the start in Rio. I have turned south on azimuth 174 deg. 22581 boats. Now clearly showing where everyone is going at the moment. I need to change to spinnaker about 10:30pm. 10:30pm back home in time! 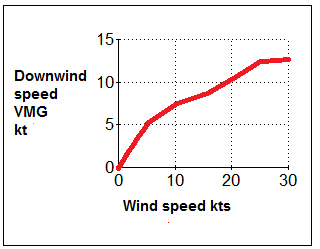 Another 25 minutes or so till 10:55 and it is time to change to spinnaker as the wind angle reaches 100 deg. 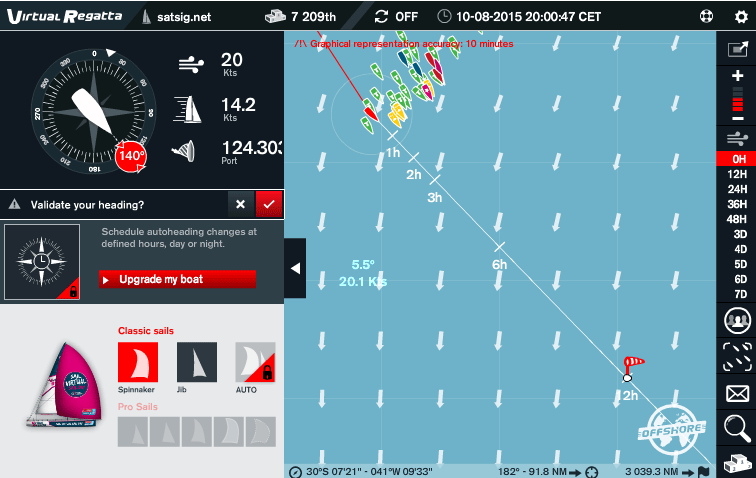 Speed now 12.4kts in 20.5kt wind. Looking good for the night on 174 with wind angle increasing from 100 to 120. At 7am tomorrow probably change course to 162 deg and over the day till 7pm change in steps to 140. Keeping the wind angle of 120 looks to be about optimum. Thursday 7am: I've set wind angle118 deg, which will gradually increase to 124 over next 3 hours, at which time I will turn left 4 deg and repeat the process. It is hard to know if changing course every hour would be better. I think I will stick with WA120 - 126 range, where the speed hardly changes, as sideways error does not seem to matter much whereas in-line distance is important. Thurs 11am: Mullionman is just 3.4 miles away from me - sails well within visible view and VHF hand held range. Down at 8935th position and gaining just 10 places every 20 minutes or so. 7pm: Thurs 8 October. Gained 1805 places in last 12 hours. Plan for tonight: 7pm till 8pm 140 deg, 8pm-11:30pm 137 deg, 11:30pm - 7am 132 deg. 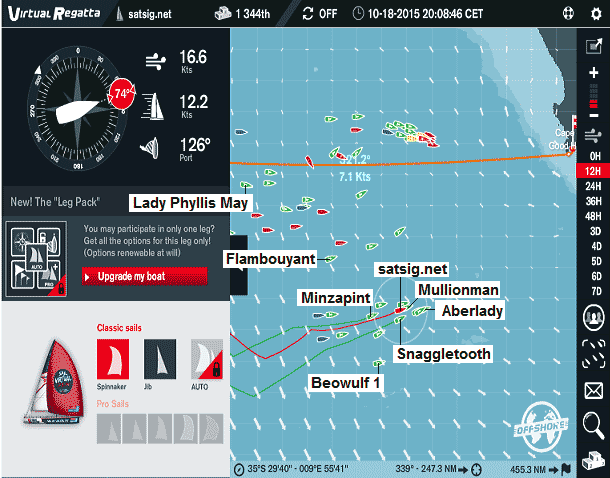 The distances on the right are relative to me, so Lady Phyllis May is 17 nautical miles ahead. 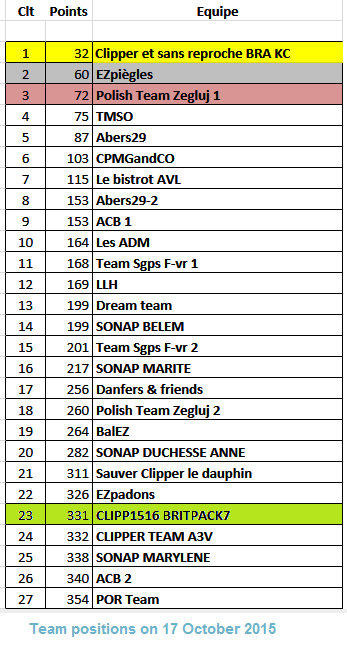 Fri 9 Oct 7am: Overnight I have moved up from 7209 to 1182 th place !! 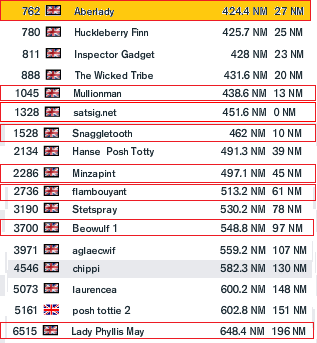 22997 competitors. The coming 12 hours does not look so good. The boats to the north east of me, the yellow ones and the red one with white star on it, are all going to have stronger winds all day, typically 18.8 kt rather than 18.2 kt. As far as navigation is concerned it is case of steady as she goes, gradually turning left to keep the wind angle 120-125, ending with a bearing of about 120 deg. 10am: Here are the boats named. 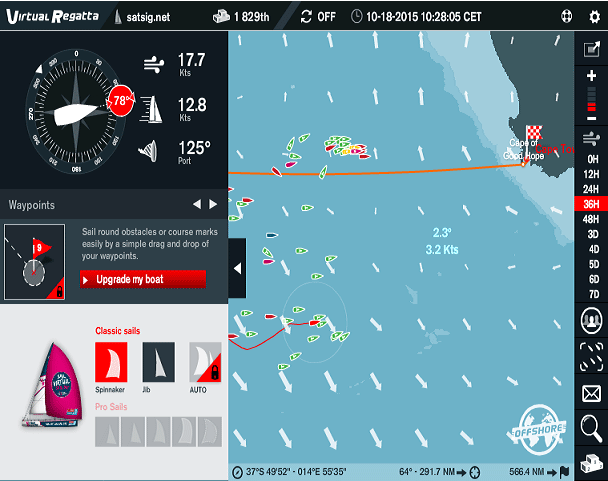 I'm going just 12.9kt in 17.9 kt wind whereas Cokdenoa II (the red one with the white star), in 3rd position, is going 13.9kt in 19kt wind. I'm gradually loosing places all the time. Cokdenoa II has has better wind now (and better PRO sails). Tonight the wind to the south west might be slightly stronger so I could make up a bit. There is a weather front (or something) coming up from the south west, in a line NW-SE with rain and short term swirls (mini depressions?) 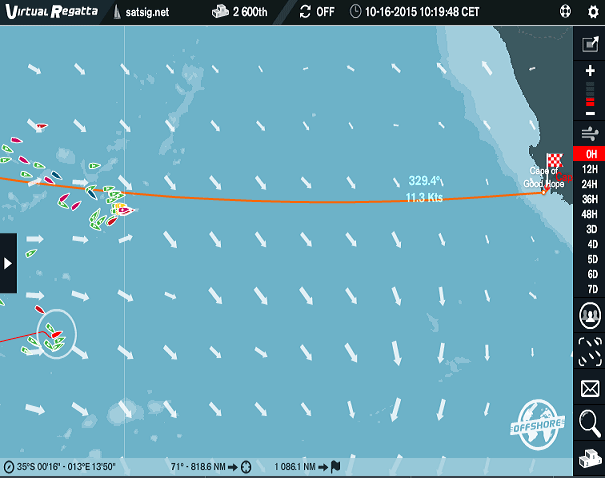 presently estimated 40 miles left of the track at about 226, 335 and 452 NM ahead, which it would be helpful to avoid. This line of rain is slowly moving NE, at uncertain speed. The game increments in large 12 hours steps with the weather then fixed for 12 hours at time which makes it difficult to predict what weather events will be in which 12hr period. It may be safer to go slightly north of the track so as not to get caught in a calm or adverse wind to the south of the red line. 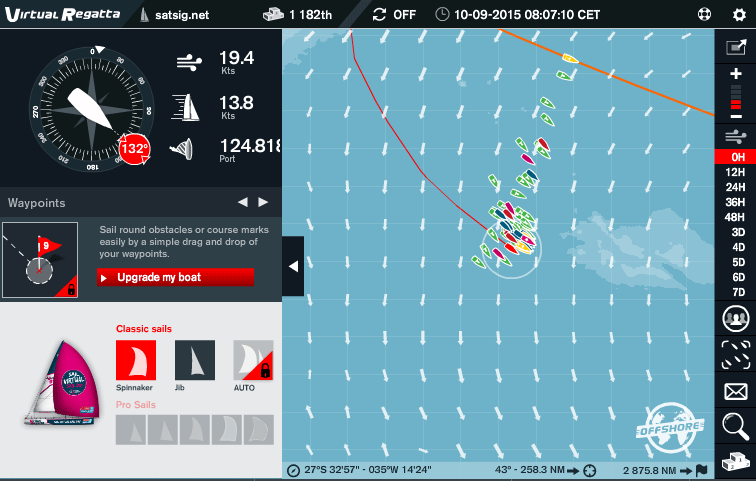 On the other hand, the best wind is exactly along the narrow red line. With weather events like this, the exact position is important. It would be nice to have real time satellite photos of the clouds, then the real boats could try to stay just to the left in the strongest winds and avoiding the rain. The team results are currently down due to a Microsoft "onedrive" server problem. 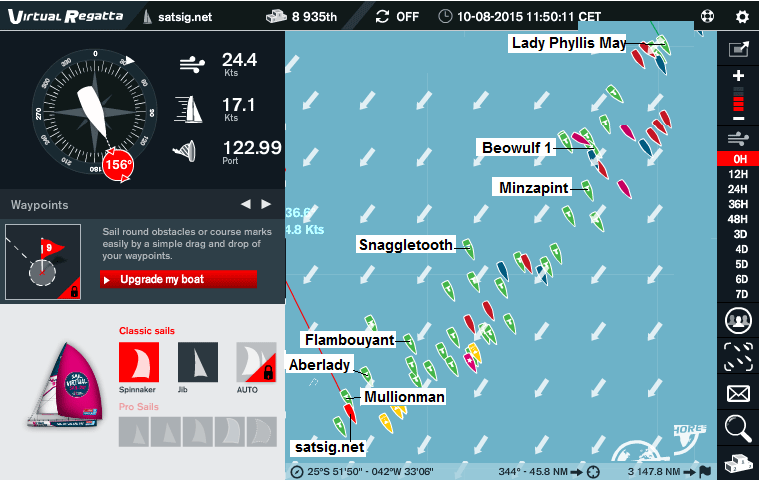 These boats appear to have a maximum speed of 18 kt at 25kt wind speed. Surely the real boats can do better than that ? 7pm Friday: I've just learned about zezo. 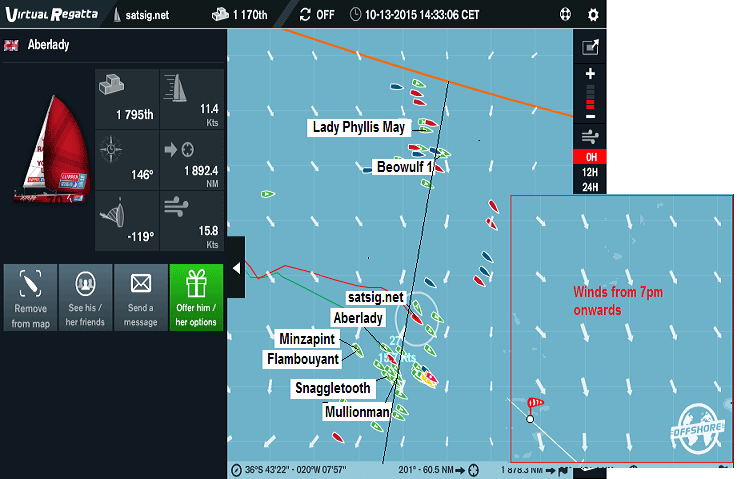 Having lost 1240 places during the day I hope to gain overnight as boats to the left have about 0.3 kt less wind. 7am Saturday 10 Oct 2015: Up 1625 places overnight. Hooray ! Here is the 'big' picture. The start at Rio on the left and Cape Town, the finish, on the far right. About 11 or 12 days to go. 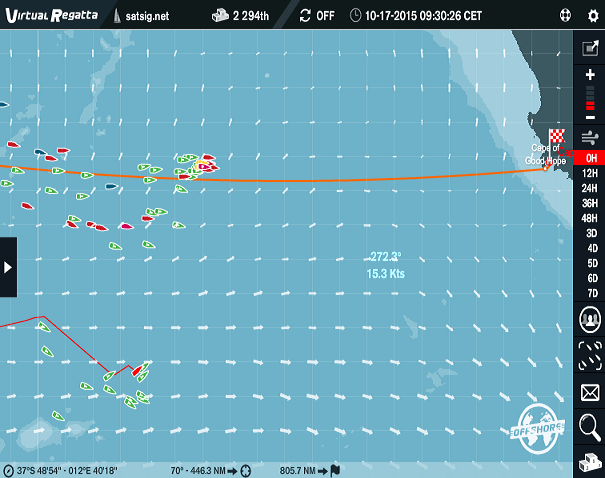 During the night I have been gradually turning left so, instead of being to the far SW of the fleet, I am now somewhere in the middle. Tonight I'm heading due east, bearing 090 for the next hour or so then about 086 deg. 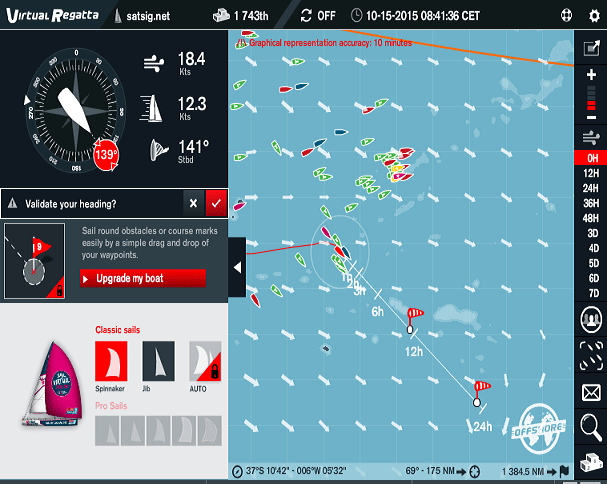 There is a problem coming up in 24 hours, illustrated above, when there are adverse winds. I need to get just far enough north to get into light following winds. 7am. 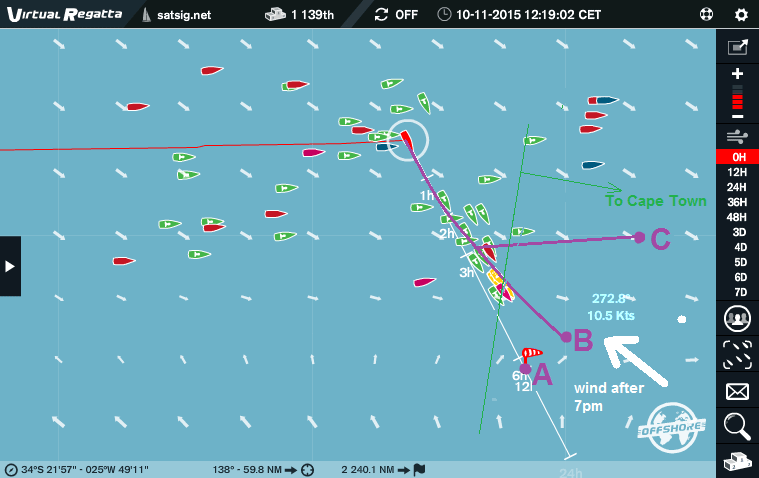 It is puzzle today to work out what to do, with adverse wind from SE forecast at 7pm. For the time being I'm just following the others, hoping they know what they are doing. I did consider turning sharp right and going south east for about 18 miles before turning east. 11:19am Coming up to Sunday lunch time now and I have just gybed, loosing 0.16 miles (9.6kt / 6 * 10%). The wind tonight is forecast to be from the south east so it seems sensible to now go directly towards this future wind as that is the direction that is most difficult after 7pm. I've marked up three possible approximate end points for 6:59 pm. 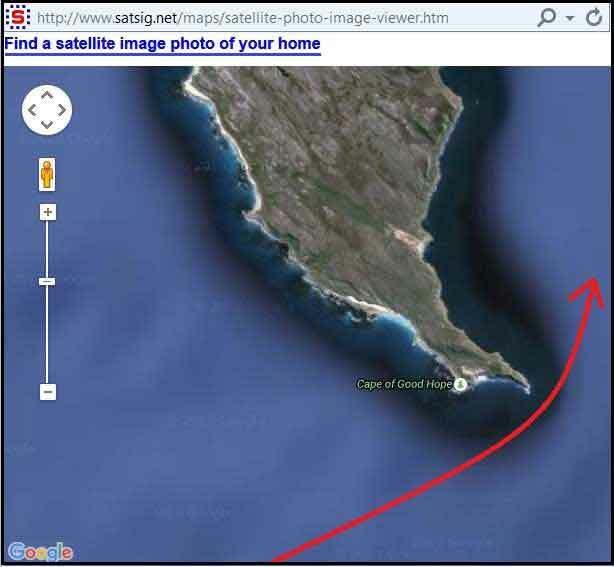 The green line is approx at right angles to the direction to Cape Town. I'm going to keep with a wind angle of about 147 and see where I end up, somewhere between B and C I hope! If you are wondering where we all are here is the picture above. Having turned south east I am loosing places fast. 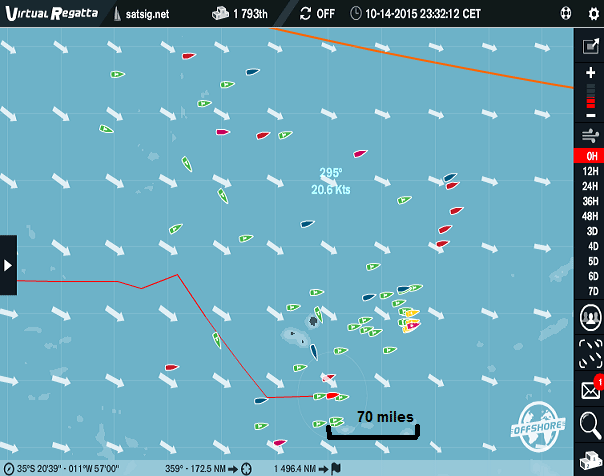 The boats on the extreme right 3 reds and 3 blues are leading but they seem to be heading straight into rather light winds directly ahead of them. Its quite possible this is wrong and the forecasts will change. You take your chance either way. 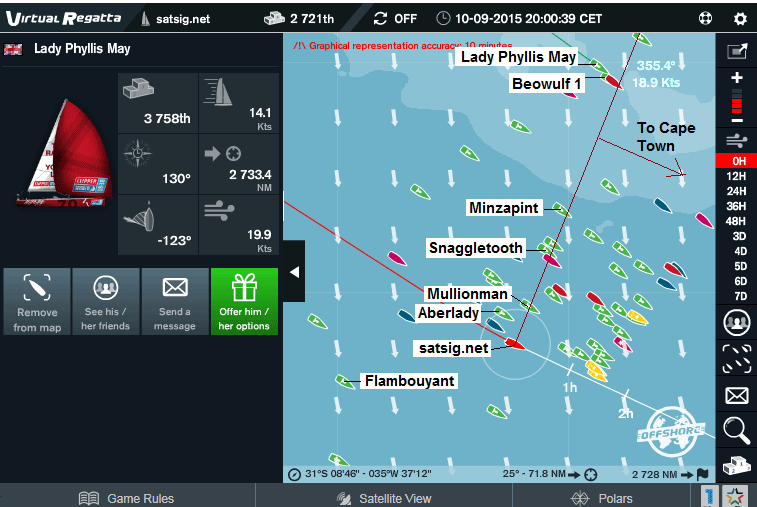 After 7pm Sunday: The fleet seems to have split in three. Lady Phyllis May and Beowulf 1 at are the extreme top and Aberlady, Minzapint, Flambouyant, Mullionman, Snaggletooth and myself are in the lower group. The little red boat on the far right is doing 5.9kt in 4.2kt of wind, heading 92 deg. 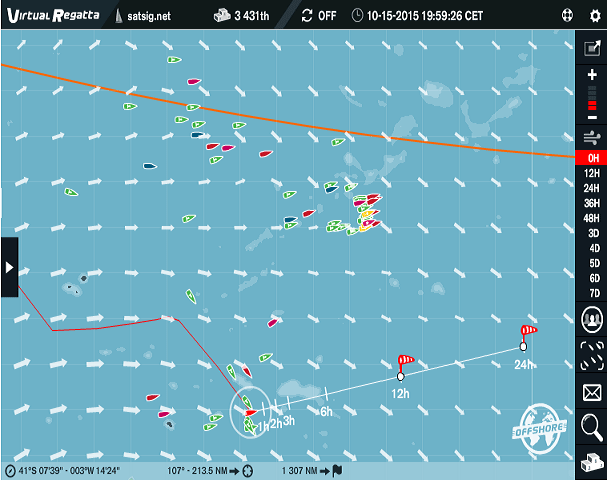 No one of our team is in the central group which is is light, but favourable winds. 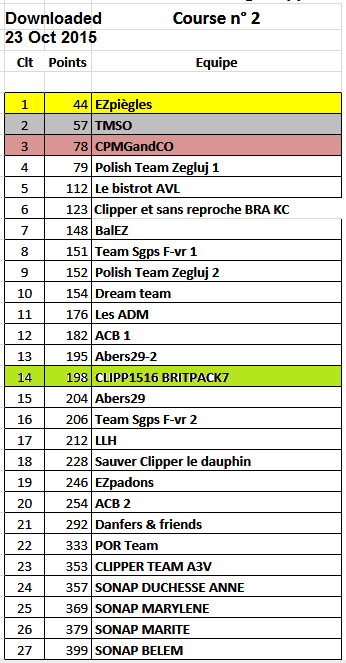 The Britpack 7 team are all within 26 miles of each other, in terms of range to cape Town. I am not sure this means much as when you change tacks you seem to lose places one way and then gain them the other or vice versa. But use of both tacks at some stage is necessary. All a bit strange?. My plan it to go north east till midnight and then turn south east till 7am tomorrow. By the time it reached midnight it was clear that no one else was turning SE so I continued NE also. Its now 7:20am Monday and most people have just turned SE, with 24 hours of slow going ahead, hopefully followed by several days of following winds. 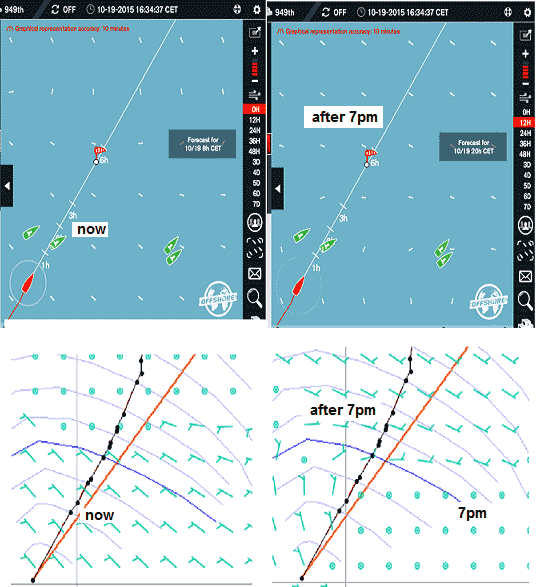 Yesterday afternoon and last night was, for me, a steady close hauled effort to get further east. This morning the wind has got up a bit and is from the north. I'm going to turn significantly south east and hopefully end up where winds should be stronger from 7pm onwards. Mid afternoon and I've put names to the team boats. 7:40am Monday 14th Oct 2015: 25087 boats: The wind is now from the north west and providing some good speed (15 knots) in the right direction. I think I will call the 130 mile sideways a 'positioning manoeuvre'. 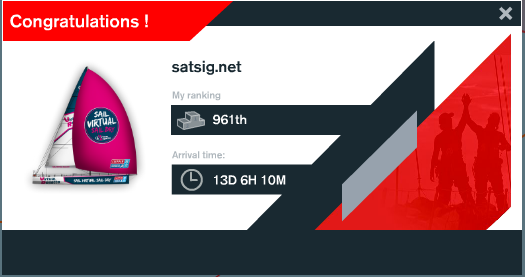 This morning I was hoping to get to under 1000th position (i was at 1160) but this evening at 7pm I was down to 1999. The theory behind this, I think, is that we will do better further south. My speed is now 14.5kt whereas the top four red boats (upper right) 12.9, 13.0, 13.0 and 13.5kts. 6*24 = 144 hours. If we can manage 1 kt difference the we should gain 144 miles. I've been going about 080 for last 3.5 hours with help from Aberlady. Tuesday morning. During the night continued east, gaining many places, was 1999th and best about 1600. Then decided to turn south east again at 5am. After 7am continued SE. Still losing places ... It all seems high risk going south like this - I think the result will either be outstanding success or complete disaster. 10am Thursday: Was going to gybe at 12:00 but now seems better to continue SE till 7pm. Its now 6pm GMT, 7pm BST and 8pmCET and we are now miles behind and down to 3431st place! Now turned left and going 16.5 knots in 26.2 wind. This is supposed to be the time when you can catch up but I am not hopeful at the moment. Friday morning: Still very doubtful. Cape of Good Hope in sight at last. 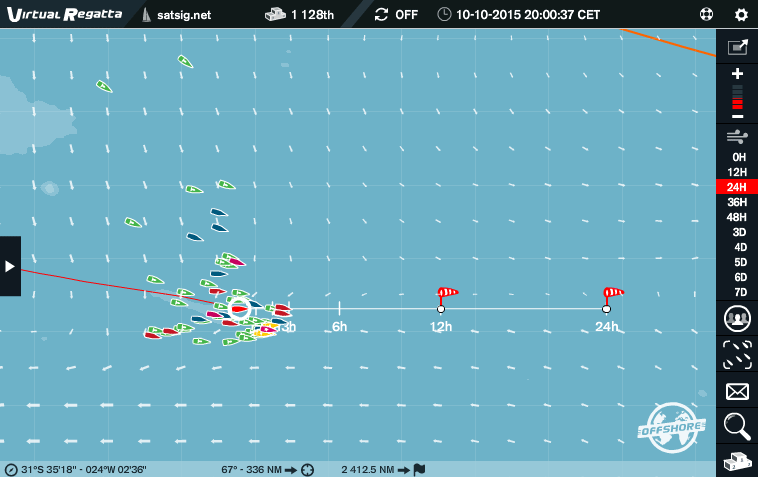 Looks like the leaders will get there 24hrs ahead of us. I suppose the best thing to say about this team table is that it can't get worse, we can now only go up in the ranking. They say that it is best to stick with a strategy - in this case keeping south and hoping for stronger winds, preferably in good directions. We will see. 7pm Friday: This morning I was 2600th, now 1858th so feeling a bit better. 7am Saturday: Trying to get eastwards in the stronger winds to the south. Trouble is that these boats respond poorly to increased wind. The lead boats are about 200miles ahead. 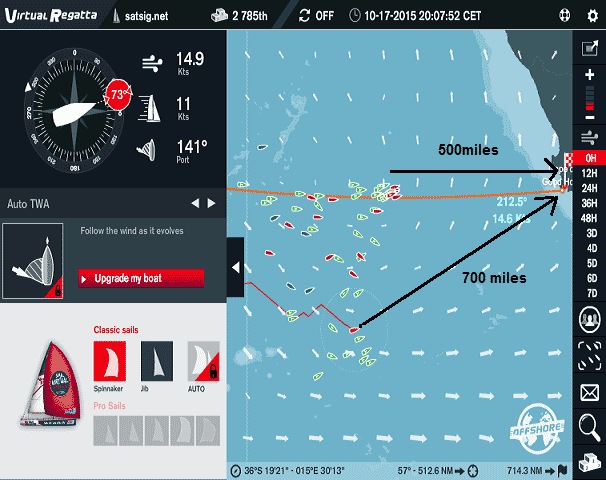 If the lead boats finish in 50 hours and the speed difference is 1kt in my favour, I am are still 150 miles behind at the finish. 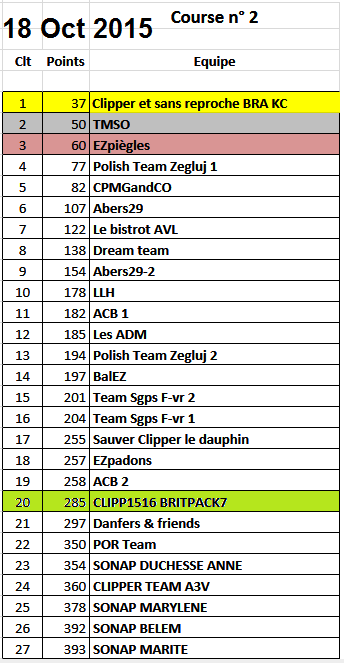 Saturday evening: Some good news: We have moved up the board, now 23rd, having been 27th before. Sunday 18th Oct. 10am: Note wind forecast is for 36 hours ahead. There is a band of low speed wind blocking the route and it is not clear to me where is the best place to cross. 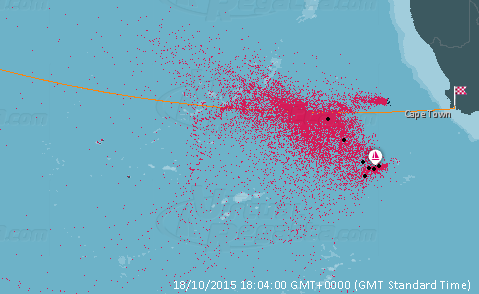 7pm Sun 18 Oct 2015: This is getting quite exciting. 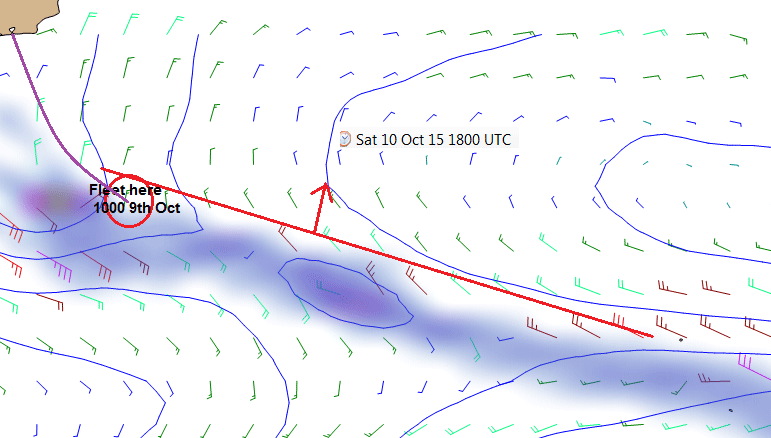 In the southern group we are making good speed about 12kt while the northern group are slower at about 9kt, so in 12 hours we make up maybe 36 miles. 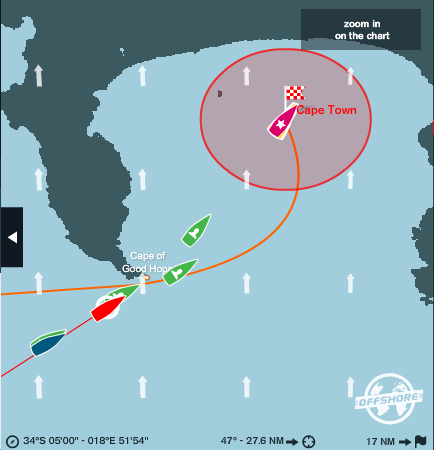 It all helps but they are already past the light winds zone and can look forward to steady progress to Cape Town. 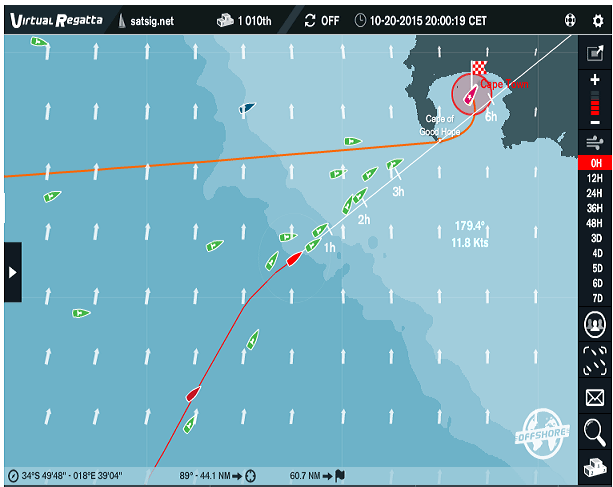 The southern group by comparison have yet to cross the light winds region. This overall 'satellite view' picture of some 24804 boats puts our positions in perspective. 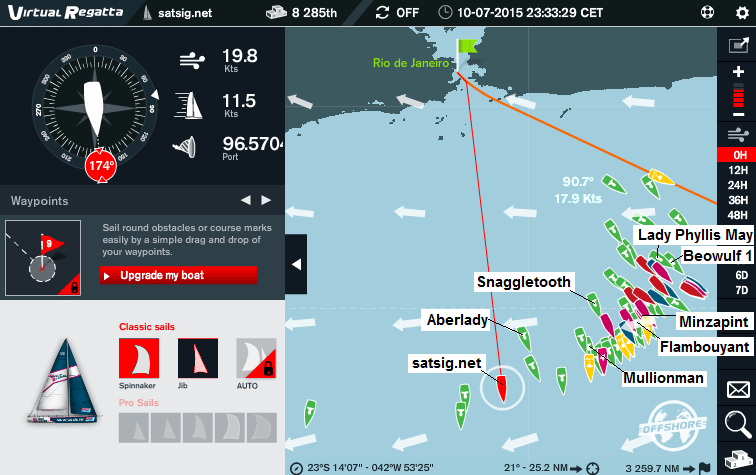 The tiny red boat is satsig.net and I've marked the positions of the other 7 boats with approximate black dots. We have moved up from 27th to 23rd to 20th. Well done everyone. 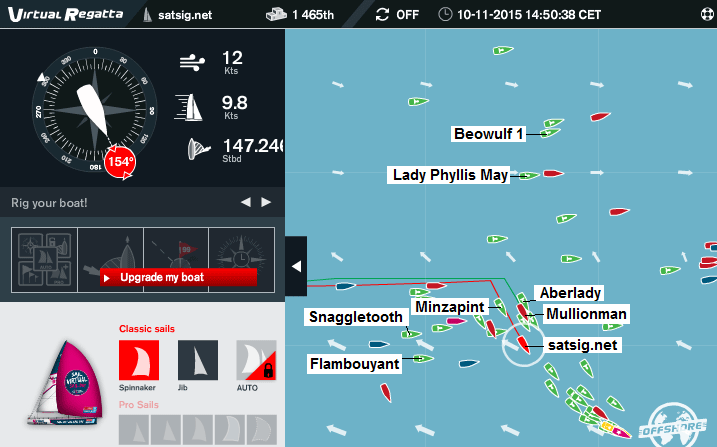 Positions of our various eight boats now. Well done Aberlady getting below 800th position, now 762nd. 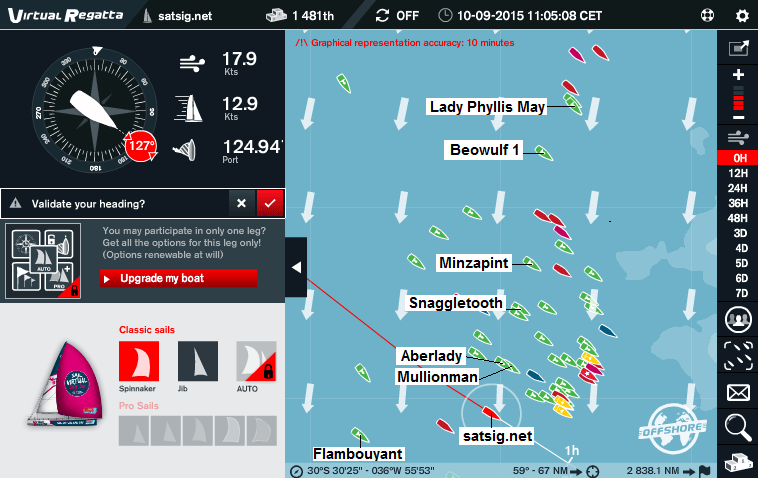 My guess is that there about 800 boats with pro sails, which is a different class, so in that regards Aberlady is near winning!. 9am Monday 19th October 2015: Something of a mystery now as to which way to go. Alternatives are north, north east or east. All have similar problem as they lead to light unpredictable winds from 7pm onwards this evening. 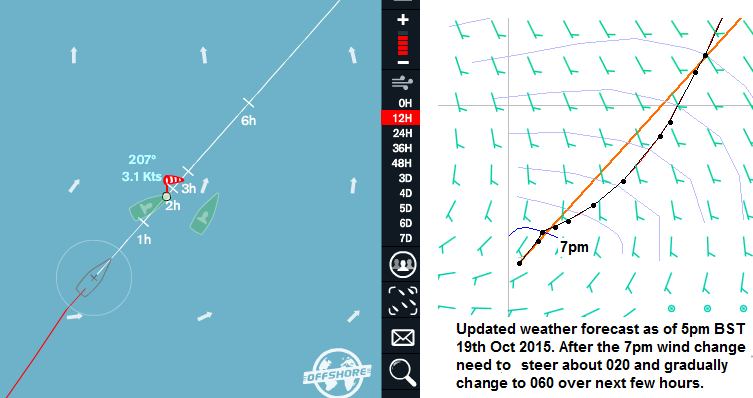 A new weather forecast may be available at 1700G, if so it gives me 2 hours to try and reposition but at 2.5kt boat speed there is not much change I can make. Pure luck but the 5pm weather forecast is quite different but still favourable. That is if you call 3.1kt favourable! The very gentle wind is from south, not the east. It will need some gradual steering changes over next few hours after 7pm. Need to remember to change from jib to spinnaker. Tuesday morning: Following some help from Aberlady. I've moved steadily NE during the night. The lead boats (mostly, if not all, with pro sails) have finished. 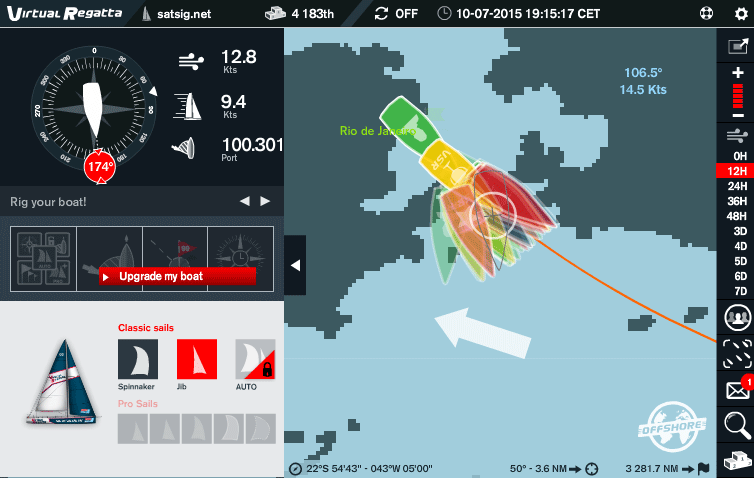 The attention now is on the sans options (SO) boats, many of which are invisible. Considering our Britpack team, Aberlady, Mullionman, myself and Snaggletooth look like being the first 4 with Minzapint and Flambouyant being 4 and 5. The top five in each team score in the results. Yesterday the gap between Minzapint and Flambouyant was 28 miles. The gap was 5 miles this morning at 7am and now at 10:25 the gap is just 4 miles. 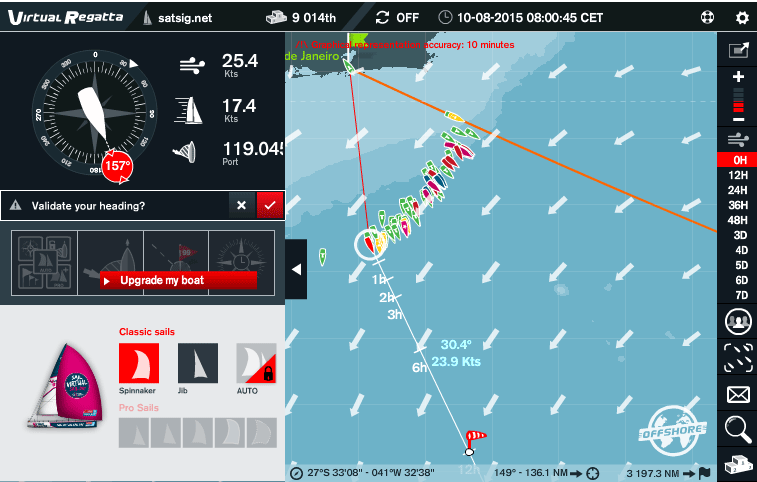 Speeds are 10.5 and 9.5 kts. Nail biting stuff as to who will get the 5th scoring place. Land ahoy ! 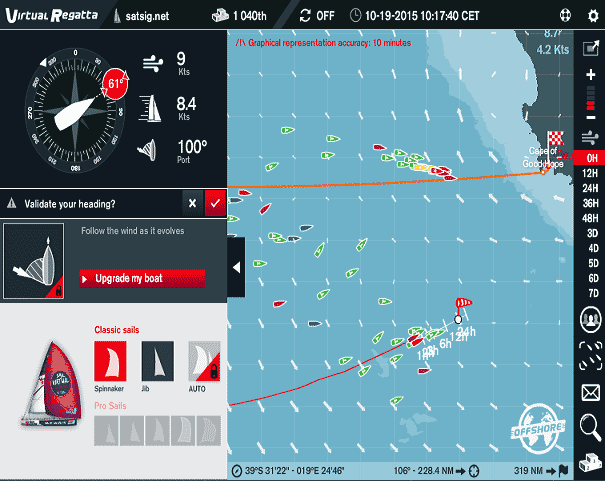 After 13 days crossing the South Atlantic from Rio Brazil, the lighthouse and lights of Cape Town are ahead. Should be crossing the finishing line in the dark at about 00:30am BST Wednesday, but still pretty cool ! It's fun to play to a Buddly Holly instrumental really loud as you go along downwind - provided other boats aren't nearby. 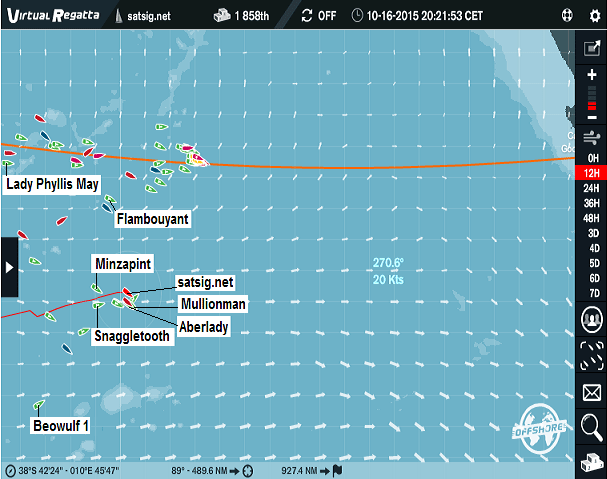 Clipper did expect: Rio de Janeiro (Br�sil) - Cape Town (Afrique du Sud), 3800 milles, 9 days. So this leg was rather slower then expected. 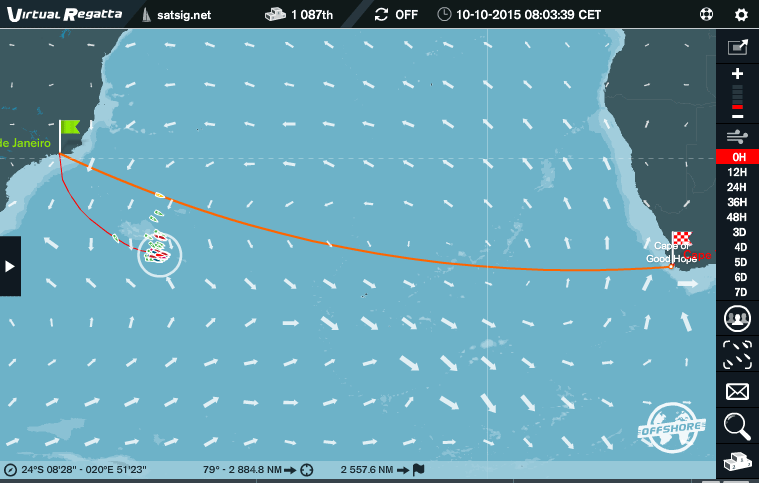 Next leg 2, Start: 31/10/2015, Cape Town (Afrique du Sud) to Albany (Australie), 5000 miles, 14 days. 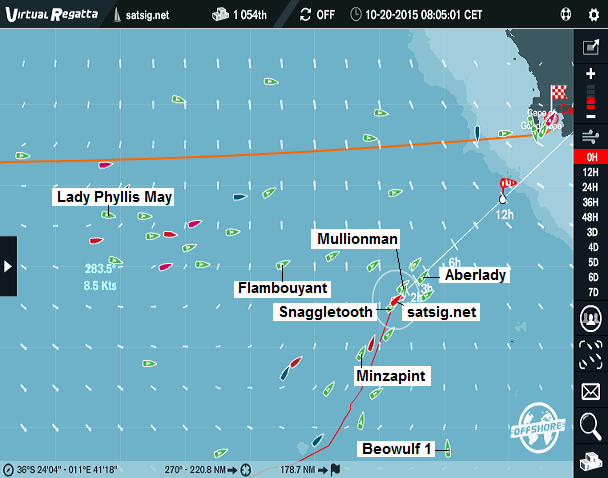 Aberlady has finished first in the team and Mullionman has just passed the headland. I'm following in 3rd position, 4.7 miles behind, in the red boat. Snaggletooth, running 4th, is 4.1 miles behind me, hidden by the blue boat. 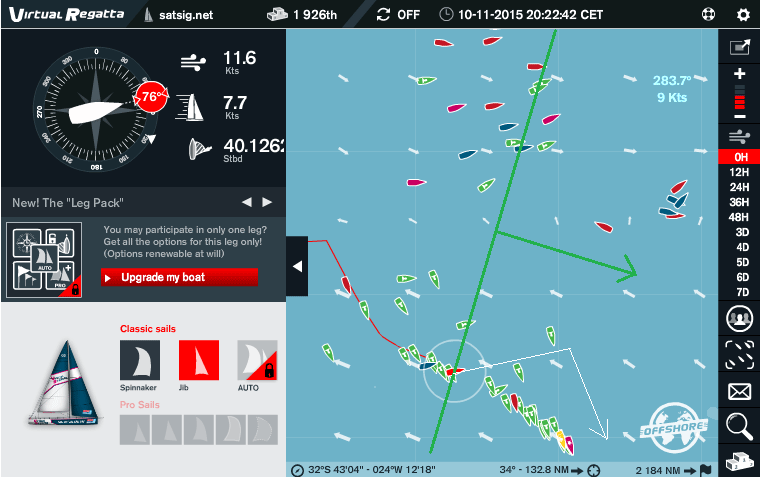 Team results for leg 2, as of evening 21st October 2015. 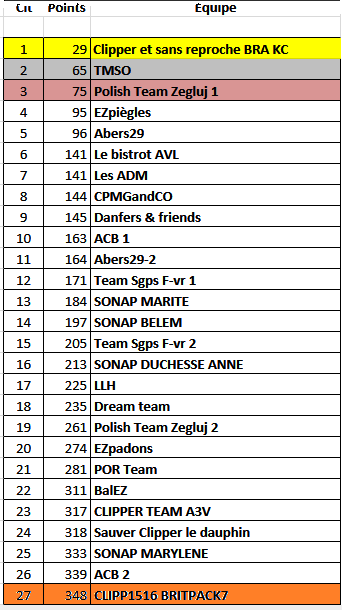 We came 23rd position in leg 1. Page created 4 October 2015, amended 7 Apr 2019. (c) 2016 Copyright Satellite Signals Limited, All rights reserved.